WHAT KIND OF SERVANT (TEAMMATE) ARE YOU? You've gone as far as you can with what you now know. Any progress you make from this moment onward will require that you learn and practice something new. Earl Nightingale said many years ago that one hour per day of study in your chosen field was all it takes. 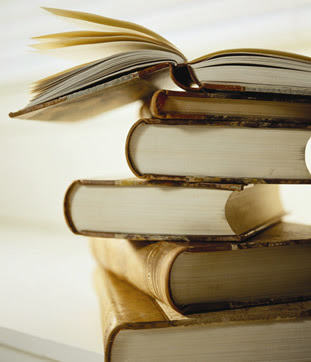 One hour per day of study will put you at the top of your field within three years. Within five years you'll be a national authority. In seven years, you can be one of the best people in the world at what you do. In fact, if you make a decision today to invest 3% of your annual income back into yourself, back into your own personal and professional development, you will probably never have to worry about money again. 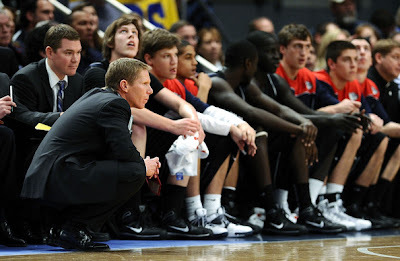 From Gonzaga head coach Mark Few: To stress the importance of taking care of the basketball they will start scrimmaging in practice and have a ball rack on the sideline at practice with x number of balls on it. 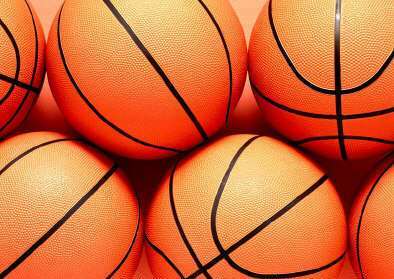 With each turnover the players commit, the ball is thrown away and they take a new one off the rack. When the rack is empty they stop scrimmaging and run for the remainder of the time. 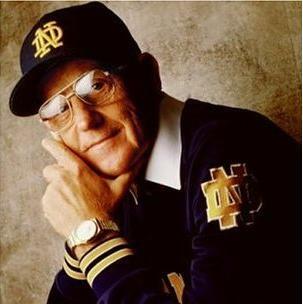 Congratulations to Kyle Schwan and Colorado Robertson for correctly answering the question that John Maxwell posted to Coach John Wooden, "What did he miss most about coaching?" Of course, the answer was "Practice -- the smell of the gym." We will get each of the winners a copy of John Maxwell's "Everyone Communicates, Few Connect" in the mail. We still have one copy left to give away and will have another contest later in the week. Thanks again to Thomas Nelson Publishing! court and set something up. 2. At the end of the game I’m putting my 5 best scorers in the game. 3. To play depth – you must have guys who can play offense. hard and aggressively to accomplish that objective. 5. If you can score you have a much better chance to win. 7. Stunting is an important untrained defensive skill – drill it daily . 8. In the 1st half we want the opponent to not reach the bonus. 10. Never can get away with fouls on the road like at home. 11. 3FG% is a very important defensive statistic. This comes from a blog I wrote back in early March from two people that have served to mentor me...one directly (Coach Wooden) and another indirectly (John Maxwell - through his books, blog, videos, etc.). What was the answer? The first two people to email me at: rstarke@lsu.edu with the correct answer will receive a free copy of John Maxwell's "Everyone Communicates, Few Connect." As I mentioned earlier, I've been given copies of "Everyone Communicates, Few Connect," from Thomas Nelson Publishing. I must remind everyone that NCAA rules prohibit me from giving them away to high school coaches, AAU coaches and prospective student-athletes (one day I may blog about some of these NCAA rules!). With the recent passing of Coach Wooden, and his relationship with John Maxwell (who mentions lessons learned from Coach Wooden in several of his books), we thought a Coach Wooden question would be perfect today. Some reasons why communicating, and more importantly connection, make such a major impact on leadership from John Maxwell's "Everyone Communicates, Few Connect." I am convinced more than ever that good communication and leadership are all about connecting. If you cannot connect with others at every level—one-on-one, in groups, and with an audience—your relationships are stronger, your sense of community improves, your ability to create teamwork increases, your influence increases, and your productivity skyrockets. If you want to become more productive and influential, learn to become a better leader because everything rises and falls on leadership. And the best leaders are always excellent connectors. Presidential historian Robert Dallek says that successful presidents exhibit five qualities that enable them to achieve things that enable them to achieve things that others don’t: vision, pragmatism, consensus building, charisma, and trustworthiness. Four of these factors depend heavily upon the ability to communicate on multiple levels. Presidents, like all leaders, need to be able to describe where they are going (vision), persuade people to come along with them (consensus), connect on a personal level (charisma), and demonstrate credibility, i.e., do what they say they will do (trust). Even pragmatism depends on communications… So in a very real sense, leadership effectiveness, both for presidents and for anyone else in a position of authority, depends to a high degree upon good communication skills. When you connect with others, you position yourself to make the most of your skills and talents. 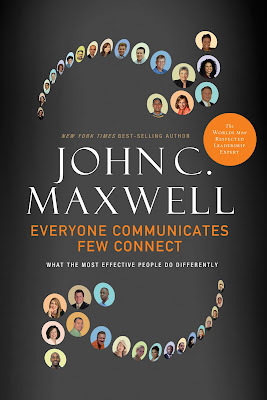 Later today, we will give away a free copy of John Maxwell's book "Everyone Communicates, Few Connect." As I mentioned previously, I've been given copies of "Everyone Communicates, Few Connect," from Thomas Nelson Publishing. I must remind everyone that NCAA rules prohibit me from giving them away to high school coaches, AAU coaches and prospective student-athletes (one day I may blog about some of these NCAA rules!). As I write this, I'm on my way to Los Angeles for a celebration of the life of John Wooden, who passed away on June 4. Coach Wooden was such a significant presence in the life of so many people over the course of his 99 years that UCLA had to require tickets for tomorrow morning's memorial, even though it's being held in one of the largest arenas in LA. And it was reported that the number of people who wanted to be there could have filled the arena four times over. How does someone impact that many lives? It is mind-boggling really. But what made John Wooden so special was that he lived as we should all aspire to live. Every month I try to tell a story about a lesson in Greatness learned from someone in the world of sports. 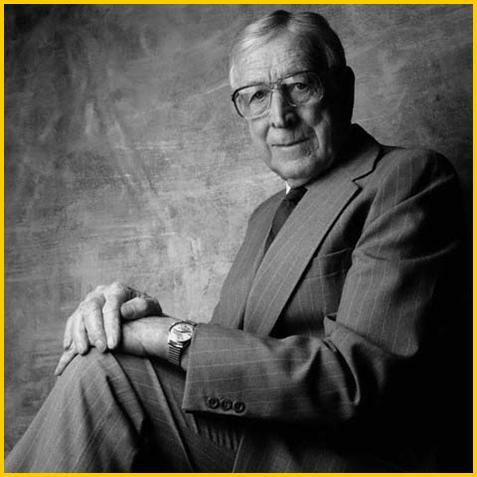 The truth is that after several years of working with and learning from John Wooden, I know that each of the 16 Characteristics of Greatness I believe exists in true winners were absolute pillars in his life. Coach Wooden invested himself in the lives of his players and in teaching them the fundamentals of the game that they all loved. His personal dedication resulted in an unprecedented 10 National Championships in 12 years. He paired players together who could push each other to grow - most notably Swen Nater and Bill Walton, as I recounted in a previous Greatness newsletter. Coach Wooden truly understood the value of association and helped his students to understand how working with people who would continually challenge them to grow was the best way to ensure than they developed their talent to the fullest degree. 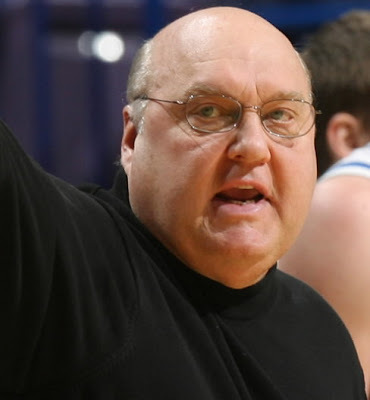 His faith was central to his life, his marriage, and the shaping of his character - and he encouraged personal spiritual development in his players, as well. He was never especially public about his beliefs but held them very deeply and sought to express his faith through his actions and his genuine love for other people. Just about everyone who ever played for Coach embraced his methods of teaching and his philosophies on life. Even those who initially thought his ideas were out of touch or outdated eventually came to realize how much they valued his outlook and spirit, and how important his gentle excitement for life was in uniting the team around a common goal of true success. He believed in being brilliant at the basics. All the fancy moves in the world will get a team no where if its members are not competent at the fundamental elements. Coach Wooden went so far as to teach his players how to put on their socks and shoes correctly to minimize blisters that might cut into practice time. "Failure to prepare is preparing to fail" he often reminded his teams. They were to do whatever they could, no matter how simple it might seem, to make sure they were ready to give their all come game time. Coach never stopped working. Even though more than a third of his life was lived post-retirement, following the 1975 season, he continued to promote causes, give speeches, write books, and meet with anyone who asked to visit him. "Make each day your masterpiece," he often said. He did not believe in allowing a single moment to go to waste but instead committed himself to learning and teaching every single day that he lived in order to continue growing in character and wisdom - up until his last day on earth. At the beginning of season, Coach would write down his prediction for how the next year would unfold, and place it in a sealed envelope in his desk. Though he never shared those goals with anyone else, he told me he was always almost exactly spot-on - and with ten National Championships to his name, as well as an 88-game undefeated streak, those goals must have been pretty high;yet he led his team to reaching them year after year. The biggest challenge of Coach's life was the loss of his beloved wife of 53 years, Nell, in 1985. Yet rather than withdrawing from the world as he mourned her loss, he challenged his intense grief into charitable works they both believed in and to speaking publicly about the importance of a solid marriage relationship. He used his own pain to help others. In 1947, when he was still coaching in Indiana State, his team received an invitation to the National Association of Intercollegiate Basketball National Tournament, but Coach Wooden turned it down because the NAIB refused to allow African-American players to compete and Wooden's team was integrated. It was a risky move to refuse the invitation because he ran the risk of alienating the governing board; but his risk paid off the very next year when they received another invitation - and his integrated team made it all the way to the finals. Coach Wooden was not a fan of the zone-press, but it was clear that the basketball was trending in that direction. It wasn't until a former player and assistant coach named Jerry Norman challenged Coach Wooden to adapt his game that the Bruins were able to take full advantage of the speed and size of their players. The change was a difficult one for Wooden to make but afterwards, he was grateful that he'd not let his pride stand in the way of changing. "Whatever you do in life," Coach said of that decision, "surround yourself with smart people who'll argue with you." 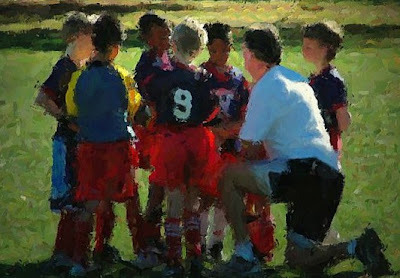 When a player scored in a game, Coach encouraged him to give a nod to the teammate who had given him the pass or set a pick for him. He didn't want any superstars to get the idea that they were more important than the team. 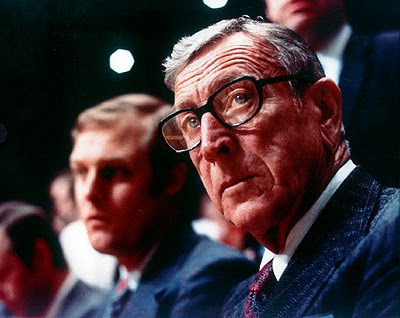 If an assistant coach made a suggestion that ended up succeeding, Coach Wooden always tried to make a point of publicly praising that individual in the press conference following the game. If the suggestion failed, Coach Wooden took the blame upon himself since he felt that as the Head Coach, the ultimate decision was his. Coach never made more than $38,000 per year, and he never asked for a raise. It was more important for him to be surrounded by a good team of assistant coaches and to be loyal to the school where he worked than to go out and seek more lucrative opportunities elsewhere. And as a testament to his leadership, many of his assistant coaches turned down head coaching positions somewhere else in order to stay a part of Coach Wooden's team. One of the most fundamental rules for his team was that they treat those around them with respect, no matter who they were or what they did. This respect was especially important, in his eyes, to the players, fans, and staff of the opposing teams. More than once, Coach Wooden received a letter of thanks from the maintenance crew at a rival school for the neat and orderly way his players left the locker room there - a gesture of respect that Coach stressed from the beginning. 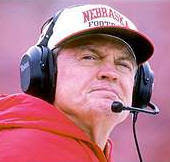 Integrity was an integral part of Coach's life. 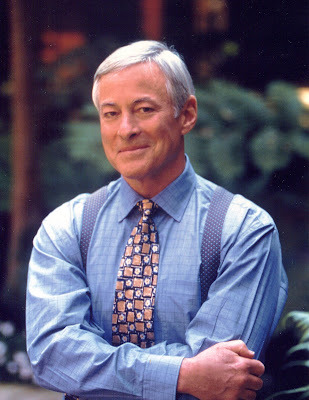 As he famously remarked: "Be more concerned with your character than your reputation, because your character is what you really are, while your reputation is merely what others think you are." Coach Wooden was always aware of his high-profile position, and sought to act accordingly. He made it a personal goal not to lose his cool on the court or lash out at referees - and on the rare occasions where he did break his calm demeanor, he always apologized to the person afterwards. He felt that setting a good example was an important responsibility that came with his position. The walls of his home were lined with awards, ceiling to floor, and in many places the plaques and certificates were stacked four and five deep. It seemed the whole world wanted to celebrate him, but Coach Wooden didn't see his career as his most important or lasting legacy. That honor belonged to his role as a mentor both to his own family (two children, seven grandchildren, and 13 great-grandchildren), as well as to the millions of fans who looked to and learned from his incredible example. He was truly one of the Great Ones, and even though he will be sorely missed, John Wooden's legacy will live on in each of us who seek to learn from his example and make his Greatness our own. "Make your personal standard of performance -- your behavior in all areas -- so exemplary that those under your supervision will find it hard to match, harder to surpass. Be hardest on yourself -- the model for what you want your team to become. Don't look for others to be your quality control expert. Be your own harshest critic." 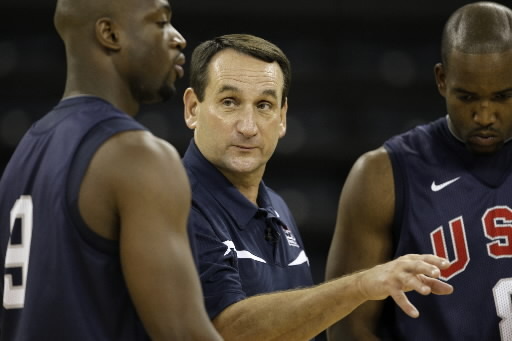 "Wake up happy every day that you're a coach...and don't forget that during a bad practice." For my whole life, I have opened my car door by inserting a metal key into a physical lock. Now, I can unlock the doors and start the car at the push of a button. It seems like magic to me, but it's actually a simple application of science. Communication acts as a leader's "keyless entry" into relationships. It can open the mind of an employer, the wallet of investors, and the hearts of loved ones. Talented communicators seem magical when they weave their words together. However, much like the concept of keyless entry, great communication depends on two simple skills—context and delivery. Context attunes a leader to the same frequency as his or her audience. Delivery allows a leader to phrase messages in a language the audience can understand. As we explore context and delivery, we'll draw upon Steven K. Scott's book "The Richest Man Who Ever Lived." In the book, Scott offers commentary on the words of King Solomon, the wealthiest man in history. Renowned for his wisdom, Solomon's writings are filled with advice about effective communication. Earn the right to be heard by listening to others. Seek to understand a situation before making judgments about it. 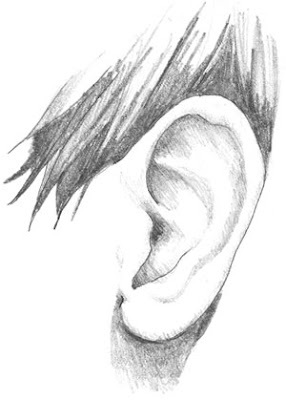 As the Greek philosopher Epictetus observed, "We have two ears and one mouth so that we can listen twice as much as we speak." People are insecure. Leaders can bestow confidence by demonstrating their trust and belief in a person's abilities. People want to feel special. Leaders win a loyal following when they are generous with compliments and acts of appreciation. People are looking for a better future. Leaders inspire through an optimistic outlook and words of hope. People are selfish. Leaders learn to motivate when they begin speaking to the needs of their people. Communicating within context involves taking the emotional temperature of others. Pay attention to facial expressions, voice inflection and posture. They give clues to a person's mood and attitude. When you're emotionally aware, you're halfway to effective communication, but you still have to deliver your words appropriately. Many times it's not what you say, but how you say it. Adopt a fitting tone to address the emotional state of those around you, and your words will have their desired effect. The National Storytelling Festival, held in Jonesborough, Tennessee, features some of America's most captivating communicators. Listen for a while, and you'll discover traits that allow them to persuade listeners to take interest in the stories they tell. Spontaneity. None of the storytellers have notes. The festival is truly an oral event. Storytellers don't read their stories; they tell them, which allows for eye contact. Poor communication is the No. 1 culprit of failed relationships—in business and at home. Since relationships are the foundation of success, leaders would be wise to invest in the communication skills of context and delivery. Master them, and you'll more easily gain favor, more readily make friends, and more effectively motivate others. Rule 1. Keep your mission in mind when answering any questions. Rule 2. Never give praise of criticism to political leaders. Rule 3. Remember that you've taken an oath to obey the orders of the president. Rule 4. If you don't want to hear or see it again, don't say it. "There is no such thing as off the record, 'cause you can say things when you're tired, frustrated, and in war, all kinds of negative stuff is said, and I knew that my style of operating, there were a lot of retired officers who didn't like my demeanor, 'cause I was direct and sometimes used colorful language and sometimes became a little too passionate," Honore says, "but one of my other rules in dealing with the press is that it's a battle drill between you and the press in terms of speaking to the American people." 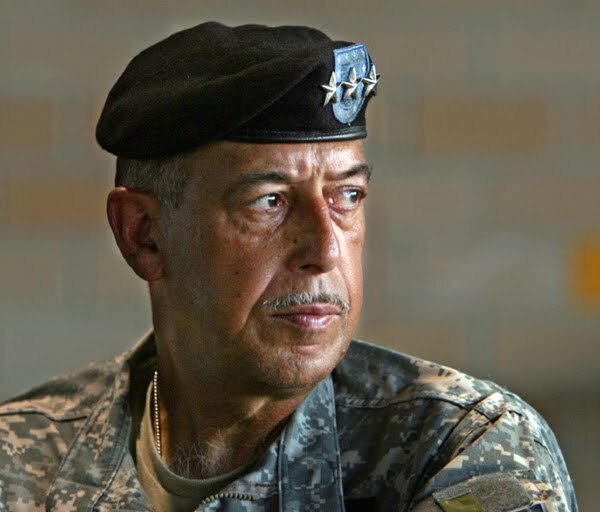 What if a general becomes so important to a mission that he feels like he can say almost anything? What happens then? I ask. Honore quotes back another famous general to me. This one, the legendary French Gen. Charles de Gaulle, who once said, "Graveyards are full of indispensable men." "I tried to explain to my players it's impossible to be perfect, but we can try hard every day to be as close as we can," Auriemma said afterward. "If you could only see all that goes into this, it's unbelievable." Benjamin Franklin once wrote, "Dost thou love life? Then do not squander time, for that's the stuff life is made of." Congratulations to Rob Passage and Bruce Hough for coming the closest to predicting the Lakers victory and their 83 points. 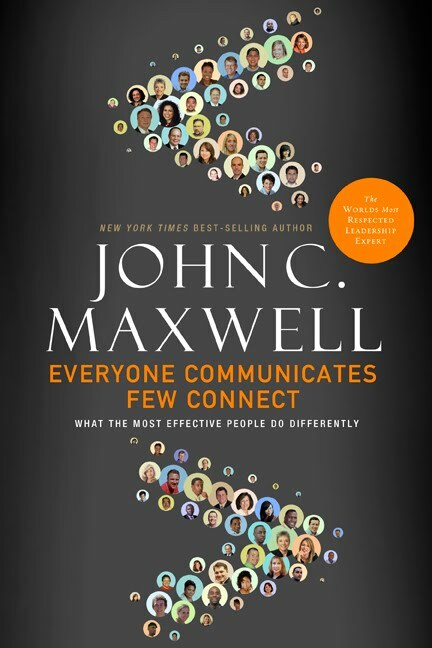 A copy of "Everyone Communicates, Few Connect" by John Maxwell is in the mail -- I promise you are going to love the book! We will have another contest in the next few days to pass along more copies of this book given to us by Thomas Nelson Publishing. The one word most often used to describe my coaching style through the years has been “disciplinarian.” Some people look at this as a derogatory comment, but I think being called a “disciplinarian” is a compliment. I don’t know how anyone can be a successful parent, teacher, coach, manager, entrepreneur, husband, wife, or friend without understanding the role discipline plays in life, and without in some form or another being a good disciplinarian. Far from shying away for it, I’ve worked hard to be the firmest and fairest disciplinarian possible, whether it has been as a parent, a coach, or the manager of a staff. Discipline is not what you do to someone, but what you do for them. Every construct in life requires discipline. Marriages require both spouses to suppress their selfish urges for the good of the relationship. That is a form of discipline, and the consequences of not following those rules are a troubled marriage. If you don’t have enough self-discipline to pay your monthly bills, you will soon suffer the consequences while sitting in the dark. If, as a parent, you don’t discipline your children, they grow up without any boundaries, which damages them well into adulthood. If you have no discipline in the workplace, then an “anything goes” attitude will soon prevail, and your company will be in trouble. In government, we have laws that impose consequences upon certain actions society deems unacceptable. And in my profession, achievement, performance, and teamwork are rewarded, while a lack of those qualities requires corrective action: discipline. If enforcing standards had made me a disciplinarian, then I gladly accept the title and plead guilty as charged. 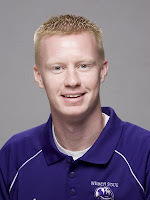 I sometimes think it is ironic that John Maxwell once played basketball and that he still studies some of the coaches and players and utilizes what he has learned in his teaching since so many of his thoughts have made in impact in how I coach and what we do in our program. When Allison Hightower was recently interviewed after being drafted by the Connecticut Sun she was asked her favorite book and she replied, "Talent is Never Enough." I smiled because that was our team's assigned reading last year. "Connecting increases your influence in every situation." "According to experts, we are bombarded with thirty-five thousand messages a day." "Talk is easy. Everybody talks. The question is, how can you make your words count? How can you really communicate with others?" Is there anything more important for us in coaching/teaching than communication? That's why this is such a special book. In the beginning of the book, Maxwell talks about three things needed for effective communication. • Something I know but do not feel, my communication is dispassionate. • Something I know but do not do, my communication is theoretical. • Something I feel but do not know, my communication is unfounded. • Something I feel, but do not do, my communication is hypocritical. • Something I do but do not know, my communication is presumptuous. • Something I do but do not feel, my communication is mechanical. As I mentioned earlier, I've been given copies of "Everyone Communicates, Few Connect," from Thomas Nelson Publishing. I must remind everyone that NCAA rules prohibit me from giving them away to high school coaches, AAU coaches and prospective student-athletes (one day I may blog about some of these NCAA rules!). But in honor of John Maxwell's love for basketball, we will utilize a basketball contest to give away two of these outstanding books. With game 7 in front of us tonight, we will utilize that for our contest. Pick a winner and a point total for the winning team and email it to me at: rstarke@lsu.edu. Your predictions must be emailed to me no later than 7 PM CST. We will take the two predictions that come closest and those people will win a copy of the book. The following comes from Dave Ulrich who is a professor of business at the Ross School of Business, University of Michigan and co-founder of The RBL Group and Wendy Ulrich who has been a practicing psychologist for over twenty years and is the author of two books. They have published a new book, The Why of Work: How Great Leaders Build Abundant Organizations That Win. At some point, all leaders have been followers. Effective leaders can identity and learn from both their good and bad leaders who motivated them and modeled how they now lead. Unfortunately, some leaders seem to forget what it means to be a follower once they become leaders. Leadership is a team sport and without followers leaders have no impact. If leaders see themselves as meaning makers, they can position themselves to guide employees to find purpose, an outcome that we believe directly benefits customers, investors and other stakeholders, and the bottom line. Leaders understand followers by customizing work so that followers not only meet goals, but also find meaning and purpose from their work experience. A number of disciplines have attempted to figure out how people make their lives meaningful. We have adapted these insights into seven questions followers ask and leaders can answer so that their followers feel well led. Identity: What do I want to be known for as an employee? Employees bring personal strengths to their work. When leaders recognize these strengths and use them to strengthen others, employees are more motivated. Statoil, headquartered in Norway, is one of the largest oil firms in the world. As they begin to do business in emerging markets, they realize that they need to identify which employees seek the adventure and sometimes trauma of working outside their home country. As they match employees' strengths and desired identity with business requirements, the right employees take the right job, find more meaning and are more productive. Purpose: What matters most to me? Employees are motivated by different things. In Pfizer's R&D group, many scientists are motivated by the insights they can generate from their research. In Pfizer's sales and marketing group, employees are more likely to be motivated by the thrill of the sale and can be motivated by setting and meeting goals. In Pfizer's government relations group, employees need to find ways to collaborate with government officials to meet federal guidelines. Many of Pfizer leaders are motivated to help build the next generation of employees. Leaders who attend to what motivates followers will help them find what matters most to them. Relationship: Whom do I work with? Work environment: How can I work in a positive work environment? Google has publicly committed to creating a positive work environment where leaders act with humility, information is widely shared, decisions are made through involving others, and the physical work setting reflects the employee's unique identity. Others have worked in a work setting characterized by politics, backbiting, and negativity. Leaders who work on culture do not have to be personally present to influence how employees feel about their work. Work itself: How can I customize the work I do? We have a friend whose ideal job would be a toll booth operator. This would not work for us or other of our friends. But she claims that this simple, repetitive, and routine work would allow her to do it well and to focus her energy on personal off-work pursuits. Leaders need to help followers customize work so that it is easy, energizing, and enjoyable. This might mean tailoring the type of work (social, intellectual, or physical), location of work (inside vs. outside), characteristics of work (routine vs. innovative, autonomous vs. control) and when I work (flexible hours vs. in office). When leaders shape work to meet the needs of followers, followers adapt to the job and are more productive. Learning and growth: How can I learn and grow from the work I do? Change happens. Leaders who help followers learn and grow from change build more successful organizations. A leader once told us that it took 50 years to create a company that can be lost in two years if it does not adapt quickly. P&G believes that being first to market with new products gives them up to 50% of market share with lagging competitors competing for the rest. Leaders help employees change by learning and being resilient from successes and failures. Followers who learn to anticipate and adapt to change rather than being threatened or overwhelmed by it find more meaning from work. Delight: How do I come to enjoy work? Sometimes work is a four letter word and can be demanding and draining. But, leaders can help employees have fun at work by using humor, by being playful, by laughing at oneself, by celebrating successes or personal days, and by encouraging civility. A leader at a technology company brought cookies to work to give employees a symbol of his concern when corporate budgets for treats were cut. When followers find fun at work, they respond in kind. •Intervene early. When two or more team members are engaged in a conflict, the sooner you step in the better. Once the dispute starts, emotions can run high, making it harder to diffuse the situation. Letting conflicts fester can result in hurt feelings and lasting resentment. Boyatzis points out that a simple disagreement can turn into a serious conflict in milliseconds, so it's critical for team managers to be aware of the team dynamics and sense when a disagreement is percolating. •Focus on team norms. The best approach to resolving disputes once they've erupted is to refer back to something the team can, or has already, agreed on. These may be explicit or implicit team norms. If you haven't previously discussed norms as a team, now is a good time to hold the conversation. Be careful not to frame the discussion around the dispute but to focus it on setting rules of engagement for going forward. •Identify a shared agreement. Your job as the team leader is to help the fighting team members reach an accord. "The key is to respect each party and the reason behind their point of view," says Brett. The only way to do this, according to Boyatzis, is to talk it through. He says that most team leaders "cut short dialogue or don't do it in an inclusive way." Once the cards are on the table, you need to "facilitate an outcome that takes into account both parties point of views," explains Brett. Compromise often has a bad connotation in the business world, but the resolution doesn't need to be a lowest common denominator answer. Rather, it should integrate both parties' interests. Whenever possible, connect the resolution back to shared purposes, values, or identity that can help both parties see eye to eye. “We all know a computer runs at its slowest when it has too many programs open at once,” Reid says. “The same applies to our production.” So, when you have a full workload, learn to say no in a courteous manner. Being realistic about your workload helps you to better perform the most important tasks at hand. Then the new project can be passed along to another person who may offer more attention to it. To make your messages more effective and to minimize the chances of miscommunication, you should construct and send messages that can be easily understood by the receiver. Use the following tips when sending messages. DIRECT...Coaches and players need to communicate directly with the person they want to receive the message. When you tell someone else to relay a message to another person, you risk them forgetting to deliver the message, distorting your message and not being able to clarify if necessary. COMPLETE AND SPECIFIC...Tell the whole story. Too often we assume the other person knows what we mean and we often leave out important information. Make sure you include all the details. CONSISTENT WITH EACH OTHER...Consistency is a big key to communication. Make sure that what you want on one day is basically the same thing the next day. STATED TO COMMUNICATE NEEDS AND FEELINGS...Communication allows us to transmit our needs and feelings to other people. Be sure that your communication clearly states your needs and feelings. FOCUSED...Focus your communication on one topic at a time. You confuse your listeners when you jump from topic to topic. REDUNDANT...Use the triple tell technique when sending messages: A) Tell them what you are going to tell them. B) Tell them C) Tell them what you told them. AT YOUR RECEIVER’S LEVEL...Be sure you use language and terminology that can be understood by your receiver. Too often coaches are more focused on teaching topics than they are on teaching people. ATTENTION GRABBING...Using another person’s name is more likely to grab the person’s attention as well as make them more open to your message. CHECKED FOR UNDERSTANDING...Be sure the people you send messages to clearly understand your intent. One of the best things you can do after sending a message is to ask the person, “What did you hear me say?” If they cannot tell you, you have a great opportunity to clarify or correct what you said. WIN A COPY OF JOHN MAXWELL'S LATES: "EVERYONE COMMUNICATES, FEW CONNECT"
Now here is the only bad part of the deal...NCAA rules prohibit me from giving the book away from high school coaches or prospective student-athletes so it will be basically opened to college coaches, fans and anyone else following me on twitter. I will be giving away the first copy on Thursday! On the first day of practice Coach Wooden didn't discuss basketball strategy. Believe it or not, he taught his players the proper way to put on their socks and shoes so they didn't get blisters. Coach Wooden didn't focus on winning. He focused on the character of his team, key fundamentals, daily improvement, effort, potential and selfless teamwork. As a result he won...a lot. Wooden was at UCLA 16 years before they won their first national title. Today we live in a world where people expect instant results. If a coach doesn't win a title in a few years he or she is fired. Wooden is a testament that greatness takes time. Wooden said, "A player who makes a team great is much more valuable than a great player." Norman Vincent Peale said that humble people don't think less of themselves. They just think of themselves less. Wooden made his life about coaching, leading and developing others and in doing so exhibited true power. In our politically correct world where people are afraid to mention God, even though it says it on our dollar bill, I find it interesting how in all the media reports about Wooden they talk positively about how his faith guided his life, principles and actions. There is power in faith. More importantly there is enormous power when your faith moves you to love, serve, inspire, coach and make a difference. The most important thing you will leave behind when you die is your legacy. And the greatest legacy you can leave is your life, your principles and the lives you touch. Wooden didn't spend his life amassing wealth and trying to make a fortune. He invested in others. And while buildings will fall, jewelry will tarnish and money will get spent, his legacy will live on in those who carry his teachings in their heart. 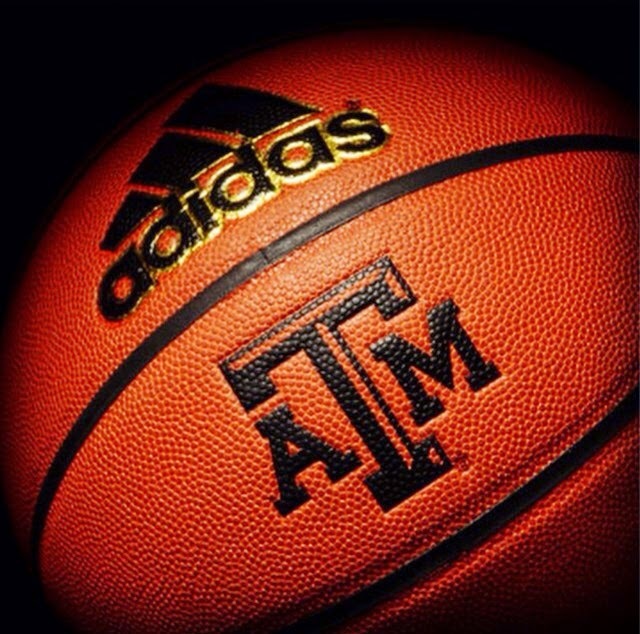 I was able to visit w/an NBA scout today who has been attending several of the current NBA pre-draft workouts. I wanted to pick his brain and ask what players are lacking or do not realize while going through these workouts. I wanted to learn more about the difference in making the jump from college to the NBA. 1. They must “Play Harder Longer”! Most players do not realize how hard you have to play in order to get a job. There have been several players that have struggled to make it through an hour workout because of their conditioning. 2. College players do not understand how hard it is to make the NBA! They do understand that most players in the league are the hardest workers. The ultimate example of this is Kobe Bryant. 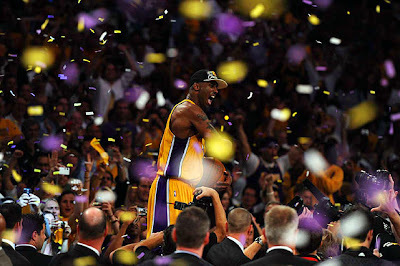 He really emphasized how everyone in the NBA knows how hard Kobe works on his game! Most NBA players are extremely hard workers! Another example he gave was a guard from the Big 12 who has showed up to his workouts 20 lbs over weight and out of shape, but still expects to make an NBA roster. Around the arc the NBA 3-point line is currently 23ft .9in and 22 ft. in the corners. The college 3-point line is 20ft. 9in. This can be up to a 3 foot difference in taking/making the 3 point shot. Perfect floaters, running layups, 3-point shots, fade aways etc. 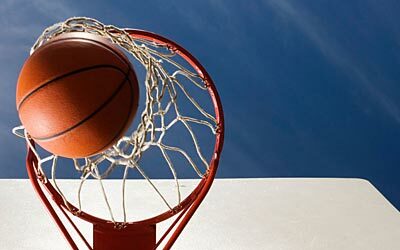 Whether the player is small or oversized for his position he must constantly work on expanding his game and simply finding more ways to score. Steve Nash calls this having “solutions” around the basket. As you study coaches at all levels around the country, it’s interesting to try to figure out what truly makes them successful. Let me throw out a few thoughts to get you thinking about where you fall in each of a few key things a successful coach needs. 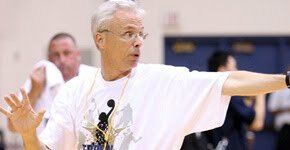 A successful coach must have the knowledge and the continued interest in keeping up with new trends, better ways of doing things, new ways to make his or her program more efficient and those little things that just might make the difference in a given season. Every team at every level has problems. Finding a way to deal with and fix a problem is the key. It's not about yelling and screaming and hoping the problem disappears. It has more to do with the ability to find out what the problem actually is, breaking down the problem, thinking about how to best fix it, and having the relationship that will ensure that the parties involved will listen to you and trust that you can help fix it. Coaching is about making adjustments. You have a plan for the game and the other coach makes an adjustment; now you have to make an adjustment. In basketball you have to be prepared to make very important decisions with very little time to make them. 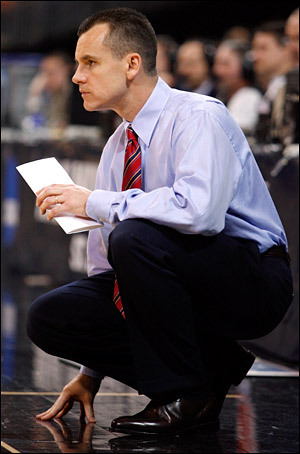 It comes down to having the poise under pressure, and that comes from having spent the time to think through every possible decision that may come up in a game. This is an area that separates the successful from the rest. There are many coaches who know a lot about the game but can’t seem to get the players to do what they want done. The key is to put the knowledge into a system that you believe in, and, most importantly, a system that you can teach. Just having the knowledge -- without the ability to transfer it to the players -- is a recipe for failure. Put some thought to these things in the off-season. What areas can you improve in? How will you implement these changes for yourself or your team? We ask our players to come back from the off-season as improved players, so we should demand the same of ourselves! • With momentum, leaders look better than they actually are. • With momentum, followers increase their performance. • Without momentum, leaders look worse than they actually are. • Without momentum, followers decrease their performance. To maximize the value of momentum, leaders must: (1) develop an appreciation for it early; (2) know the key ingredients of it immediately; and (3) pour resources into it always. I received the following email from my mentor Dale Brown last night. He titled it "My Tribute To Coach Wooden." My dear friend John Wooden is truly an American treasure. He was kind, caring, highly intelligent, vibrant, strong-willed, principled, humble, and one of the most fascinating men of this or any generation. Why was the greatest coach that ever lived like this and not egotistical, selfish, arrogant, and greedy like so many that reach the pinnacle of what the world often defines as success? It is because he firmly believed in what the first Webster’s dictionary ever printed in 1806 describing success as, fortunate, happy, kind and prosperous. And not how dictionaries define success today, which is, attainment of wealth, fame and rank. I have also heard him mention on several occasions that the four things mankind craves the most are freedom, happiness, peace, and love. And none of these can be obtained without first giving them to someone else, and oh how he gave for so many years. He is indeed a legend in basketball but more importantly he was a legend in serving mankind as a master teacher. • Nothing in life breeds resilience like adversity and failure. 3. Adversity pushes the envelope of accepted performance. Until a person learns from experience that he can live through adversity, he is reluctant to buck mindless tradition, push the envelope of organizational performance, or challenge himself to press his physical limits. Failure prompts a person to rethink the status quo. 4. Adversity provides greater opportunities. I believe that eliminating problems limits our potential. For example, in 1978, Bernie Marcus, the son of a poor Russian cabinetmaker in Newark, New Jersey, was fired from Handy Dan, a do-it-yourself hardware retailer. That prompted Marcus to team with Arthur Blank to start their own business. In 1979, they opened their first store in Atlanta, Georgia. It was called The Home Depot. Today, The Home Depot has more than 760 stores employing more than 157,000 people, the business has expanded to include overseas operations, and each year the corporation does more than $30 billion in sales. The ability to innovate is at the heart of creativity—a vital component in success. 6. Adversity recaps unexpected benefits. Horace Walpole said that “in science, mistakes always precede the truth. Years ago, when Bear Bryant was coaching the University of Alabama’s football team, the Crimson Tide was ahead by only six points in a game with less than two minutes remaining in the fourth quarter. Bryant sent his quarterback into the game with instruction to play it safe and run out the clock. In the huddle, the quarterback said, “Coach says to play it safe, but that’s what they’re expecting. Let’s give them a surprise.” And with that, he called a pass play. When the quarterback dropped back and threw the pass, the defending cornerback, who was a champion sprinter, intercepted the ball and headed toward the end zone, expecting to score a touchdown. The quarterback, who was not known as a good runner, took off after the cornerback and ran him down from behind, tackling him on the 5-yard line. His effort saved the game. Nothing can motivate a person like adversity. A COACH GETS YOU TO YOUR "DESIRED DESTINATION"
DON MEYER'S DEFINITION OF "TEAMS"